The ambitious project has once again fallen victim to the grind of mainstream politics, and its long-term future is uncertain. The Russian-Ukrainian Antonov An-70 military transport plane has successfully completed state testing. All the aircraft’s systems were tested, as well as its short take-off and landing characteristics. The navigational accuracy of the plane’s onboard equipment, its structural strength and service life, and the reliability of the various systems were also tested, as well as the aircraft’s ability to transport specific cargoes. However, it is unlikely that a successful conclusion to testing will secure series production of the aircraft. The project has stood on the brink of cancellation several times, after becoming an unavoidable victim of the political climate. Russian-Ukrainian cooperation on the An-70 programme almost collapsed during Viktor Yushchenko’s term as Ukrainian president. Work on the project resumed only after Viktor Yanukovych had taken office. Despite being dogged by a series of setbacks, this four-engine wide body military ‘transport’ is a much-anticipated aircraft. The MAKS 2013 air show in Moscow sparked interest in the An-70, after the massive high-winged turboprop brilliantly performed a series of flying displays. 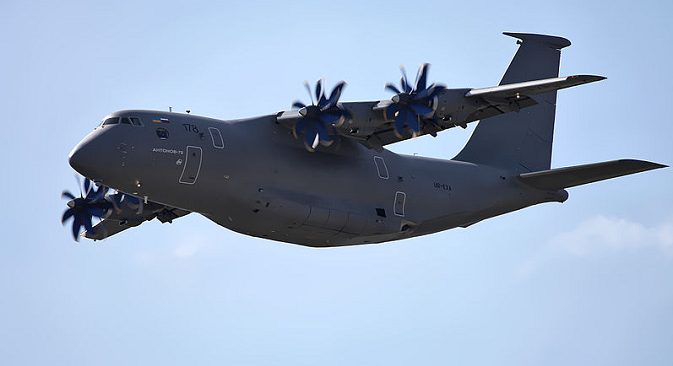 The European Union had previously tried to create a similar aircraft in the shape of the A-400M, but this was not successful and the European aircraft turned out to be worse in terms of its flight performance characteristics than the An-70. This aircraft is able to operate from short (600-800 m) unmade runways and has a range of 7,000-8,000 km. With a 3-ton cargo, the An-70’s range is 3,000 km. The Russian Ministry of Defence, which needs a medium range transport aircraft to fulfil a tactical operations role, had planned to purchase the An-70. The Russian military were interested in the aircraft’s ability to operate from short runways. Along with Russia’s heavy Ilyushin Il-476, the An-70 would have modernized the fleet of military transport aircraft, replacing the obsolete An-12. In 2012 the ministry estimated that the Russian Air Force would require 60 aircraft. Two years ago, Russia and Ukraine even reached agreement on where the aircraft would be manufactured. It was decided that it would be produced in Kazan using the capabilities of the Kazan Aviation Manufacturing Association. Ukrainian manufacturing plants retained production of the engines (to be made by Motor Sich in Zaporozhye), the wings and the aircraft’s tail section (to be made by GP Antonov – Gosudarstvennoe Predpriyatie – the Antonov State Enterprise). The Kazan plant was entrusted with manufacturing the fuselage and carrying out final assembly. Today, in a period of extreme aggravation of Russian-Ukrainian relations, this ambitious project has again fallen victim to the grind of mainstream politics, and its long-term future is uncertain. Oleg Panteleyev, editor-in-chief of aviation industry journal Aviaport, told RIR that in the current climate, work to bring the An-70 to fruition is effectively impossible. All projects coordinated at governmental level have collapsed. This complex situation is developing as a result of the stance adopted by Ukrainian politicians, who are putting pressure on the manufacturers and demanding they end cooperation with Russia. The Russian Air Force’s requirement for a transport aircraft would be met with the help of the Il-476 and to some degree by the Multi-Role Transport Aircraft produced jointly by Russia and India. Oleg Panteleyev thinks that the load capacity of the MTS would naturally be half that of the An-70, however it would be able to operate from unmade airfields. Theoretically, exporting the An-70 to third party nations would prove its salvation. However, the industry expert is highly sceptical about this. It is possible to sell aircraft documentation and the power plant. China and Brazil could also be interested in a deal, according to Panteleyev. The export potential of this transport aircraft, however, looks decidedly bleak. It is unlikely that Ukraine will organise series production of this aircraft by itself. Russian enterprises have become engaged in cooperation and it is unrealistic for them to opt out within a reasonable timescale.